Scandinavians are consistently ranked the happiest people on earth. In 2017, Norwegians ranks first place in the World Happiness Report. Their secret to enjoying frigid temps during the polar night is a love for all things cozy, and one of the key ingredient is mulled wine. 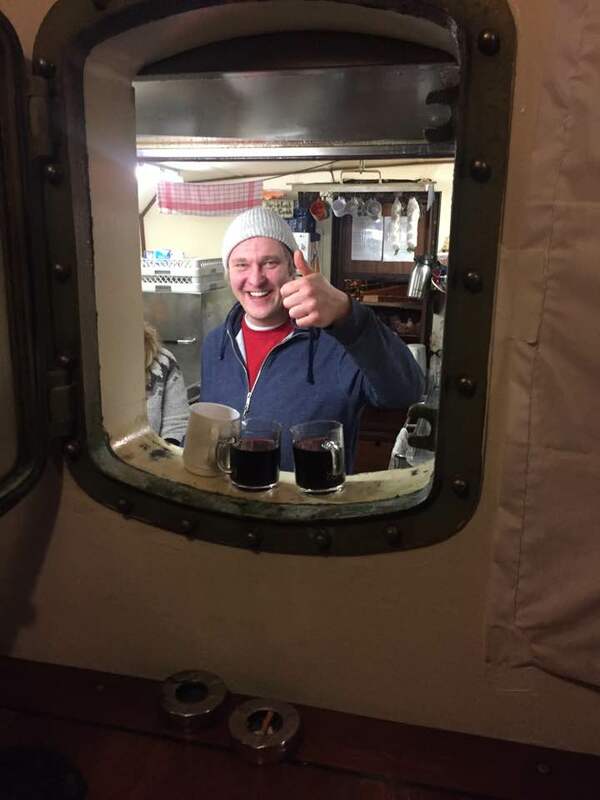 Here is my mulled wine recipe, aka Gløgg, that I made for everyone aboard the Antigua during our Arctic adventure. It is even better when you drink it on deck and add disco lights and dancing. Enjoy! 1) Crack the cardamom seed pods in a mortar and pestle. Grate the zest of an orange. 2) For the infusion add cinnamon, cardamom, cloves, orange zest, with water and sugar. 3) Warm over a medium-low flame and stir occasionally until it becomes a clear, golden syrup and all the sugar is dissolved. Let it simmer for about 10 minutes until the tiny bubbles become large bubbles. This caramelizes the sugar and adds a layer of flavor. 4) When your syrup is ready, you can either let it cool overnight or lower the flame and add the rest of the booze (wine, port, etc). I like to strain it so things aren’t floating around but you can skip this step. 5) Taste. Heat on low with a lid so the alcohol doesn’t evaporate. If you wish, add more sugar or brandy or the juice of the orange to taste. 6) I skipped the almonds and raisins but Jana kept it classy by adding orange slices for garnish. You can serve your gløgg immediately (or bottle it or any leftovers). A month or two of aging really enhances the flavors. Leigh McCarthy is a multimedia raconteur.